Comments: I really like this CD. 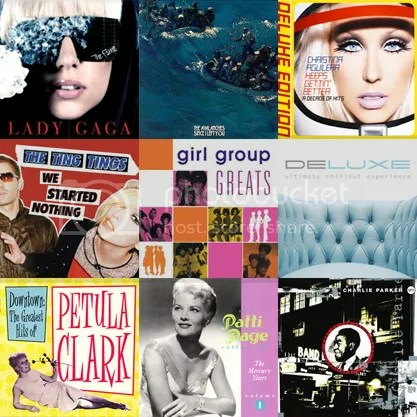 Tracks that stand out: .Just Dance, Poker Face and Starstruck. Been listening to it (and the remixes I downloaded from Limewire) for weeks now. What she lacks in attractiveness (she hasn’t got the memo that she’s not all that and a bag of chips), she more than makes up for in style and self-esteem. Comments: Came across this one by accident (some seasonal help at work brought it with them) and ended up really liking it. Not for everyone, but an interesting and eclectic mix of samples. Kind of hard to explain, but in a good way. You can listen to the tracks over at Amazon, to get an idea. Comments: Never really been a big fan of the actual SINGER, but I love her visual style. Also, I gotta say that all the new tracks: Dynamite, Keeps Gettin’ Better and the excellent “re-imagining” (I call it a remix) of Genie in a Bottle (here, known as Genie 2.0) and You Are (Beautiful) are excellent. Esp. Genie 2.0; utterly unrecognizable from the original, other than the lyrics. May make you a fan of the song, even if you were never a big fan of the original mix. Totally different and utterly groovy. Comments: I got this one for Christmas from my friend Nathan, and fell in love with their sound. Good through and through. Comments: I won’t even tell you what I paid for this one. I’m torn: on one hand, I’m ashamed, on the other hand, it’s not available anywhere except Bed, Bath & Beyond (and on the off chance you can even find the title anywhere else, the price simply does not change). And when I say it’s not available anywhere else, I mean it. Trust me, I tried to find this one used elsewhere online, to no avail. Finally broke down and paid what they were asking for it. Was worth every penny. Love both discs. Excellent excellent. Comments: I finally completed the 3-disc collection! OMG, I about fainted when I stumbled across this one. I’ve had 2 of the 3 volumes for years, but could never locate the 3rd volume. Released as a set, but always sold as individuals at used stores, this one is worth seeking out. Excellent. Comments: Love Bessie Smith, so needless to say I was very excited when this one came into the store the other night. A guy came in with 2 huge Rubbermaid tubs and sold what appeared to be his entire CD collection. And that’s where all these classic Blues CDs came from. Jackpot!! Comments: Never seen this one before and is apparently one of the harder albums to find. I just got lucky. I’ve heard of Lady Gaga but haven’t heard her music yet. I will have to check some of these out. I love Petula Clark’s Downtown! Somewhere around here I have an old Petula Clark 33 rpm album with that song on it. No way to play it though. I just received a couple cds from Amazon a few days ago: Leona Lewis “Spirit” and an oldie from 1984, Alphaville’s Forever Young which I’m listening to right this moment. I was flipping tv channels recently and stopped on the movie Napolean Dynamite right when they were showing the dance scene and Alphaville’s song Forever Young was playing. That made me look up the song on youtube and I enjoyed watching the old video so much that I ordered the cd. I like the entire cd.